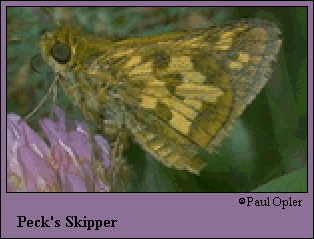 Identification: Upperside of male is brown with reddish-orange patches; forewing has a sinuous stigma. Female is darker with no stigma. Underside of the hindwing of both sexes has a patch of large yellow spots in the center surrounded by dark brown. Life history: Males perch in sunny open areas to await receptive females, and courtship takes place throughout the day. Females lay eggs singly; caterpillars eat leaves and live in leaf shelters. Caterpillars and chrysalids hibernate.